We can definitely file this one under the “impressive feat of technical achievement, but we’re not exactly sure why” category. For some bizarre reason, one developer has dedicated what is presumably a fair bit of his time to hacking the Apple Watch to get Microsoft’s 20-year-old operating system – Windows 95 – running on Apple’s first wearable. A video of the whole experiment has been shared with the world, and as you might imagine, it’s not exactly a fantastic user-experience, but is a lot more functional than you would imagine for a hardware/software combination from entirely different decades. The Apple Watch may be a relatively small device in comparison to notebooks and desktop machines, but it’s actually packing pretty formidable specs. With a 520MHz processor, 8GB of internal storage, and 512MB RAM, Apple’s intelligent timepiece contains specifications that far outweighs what the typical home computer would have shipped with back in 1995. As Lee points out, a typical machine in the mid-90s would have shipped with 512MB of storage, not memory. The processor alone is approximately 25-times faster than those popular Intel chips that were powering desktop computers back then. With those specs in mind, it got the investigative developer thinking. Could the Apple Watch be capable of running Microsoft’s extremely popular Windows 95 operating system? The answer appears to be simple; after patching files within a WatchKit app, the developer was able to invoke his own code rather than Apple’s and get Windows 95 up and running, albeit painfully slow. Of course, there’s a lot more to it than simply building a WatchKit app and feeding the Windows 95 disk image into the app bundle. 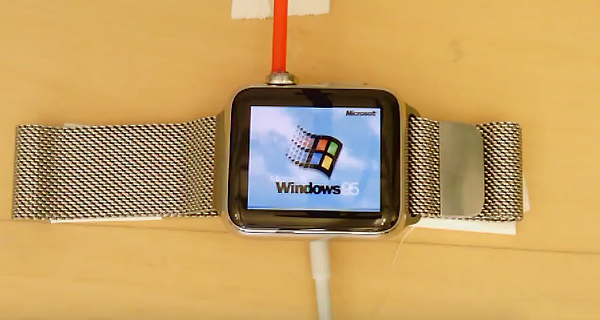 This force running of Windows 95 onto the Apple Watch wasn’t exactly “conventional”, with a number of challenges to overcome. It was one battle to actually build Windows 95 into a functioning Apple Watch app, but it was another challenge to actually prevent the Apple Watch display from falling asleep when not in use. To get around that “by design” function, Lee jerry-rigged a motorized tube to the Apple Watch Digital Crown to continually keep it in motion and prevent the screen from going onto standby. Check out the video for yourself. It’s not the most performant port we’ve ever seen, but it’s definitely a masterclass piece of work. If you want to try it all on your Apple Watch, the developer has posted the entire project online with everything required to run Windows 95 on Apple Watch in one place. You can find it on GitHub here. Not trying to belittle what is obviously a very difficult thing to make possible, but why would you want to?! ..other than to say that you did it, which is the developer’s achievement really. I doubt that this is true. It probably could, but lack of driver support would make it pointless. ..then again running win 95 at all on modern hardware is slightly pointless. Unless perhaps you needed to run a particular piece of software that won’t work on a modern OS. Like I commented on a different blog…..Why? Why not run linux Trsuty? Or CentOS….no nerd in 2016 would spend a minute trying to run a garbage OS from the 1800s for no other reason than to say, Oh look, I can run this, total BS. Second edit: Touch screen support on Win95?? Even if a mouse was to be plugged in……a PS2 Mouse in 2016?. Have you herd of vmware?